Still on my #buyNigerian tag, uhun. I've known Khuraira Cosmetics for about 6 years now. They were the only Nigerian brand based abroad that I reached out to via mail and got a positive response from. I'm still a huge promoter of Nigerian brands, like when I first started blogging and I haven't deviated much from it so if by any means you'd like to see your Nigerian beauty brand/product on here, then by all means send me a message. I discovered the beauty of blushes a couple of years after my foray into makeup and I've never departed from it since then. Infact, if I were asked the 3 beauty products I must have in the desert, blush would be one of them, lol. 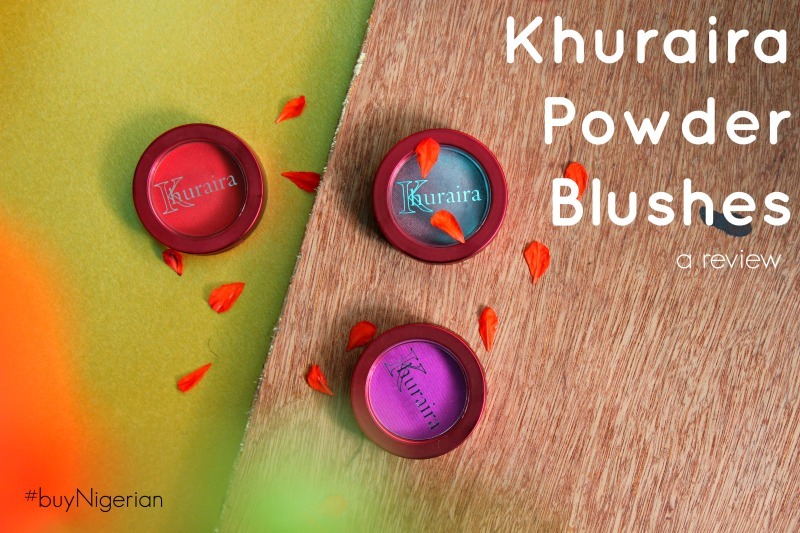 I've had these Khuraira blushes for a while now but I've only just gotten round to posting a proper review of them here. I got more than these three here but females around nabbed the others leaving with me with these which thankfully, are actually my fav of the bunch I received. Every one knows that red blush is the best friend of african skin as its the one shade that flatters from the lighest to the darkest shade of African skin. Rouge is a lovely matte red I'm obsessed with. Its super pigmented so I tell my sister "dab just the tip of the blush brush into the product"
As you all know, my love for shimmer has limits and I was a bit skeptical but considering that Prunelle is simply gorgeous as a subtle, smokey purple eyeshadow and works 2 way as a highlighter and blush on the cheeks, I'm completely sold on it. The pigmentation, the vibrant colours (more reason why this here product is made for African women. Yup, we taking Khuraira cosmetics too when we #Blaxit), the multi-useability of these products makes them a definite must have for everyone who is makeup obsessed.